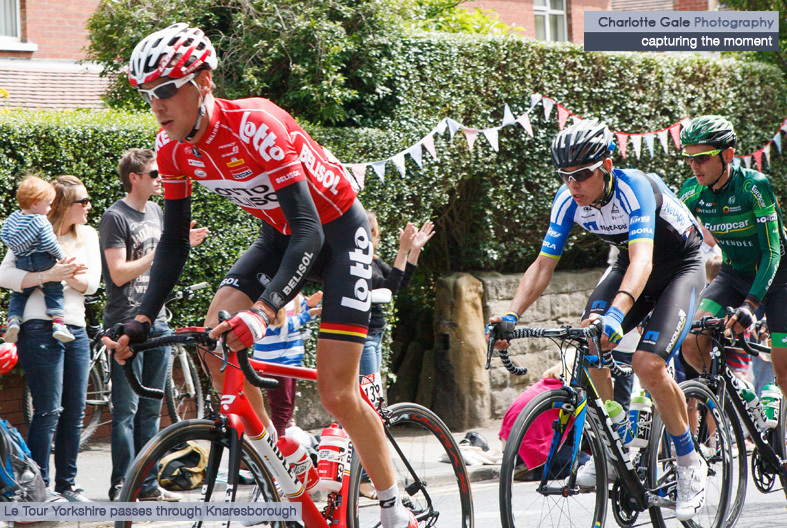 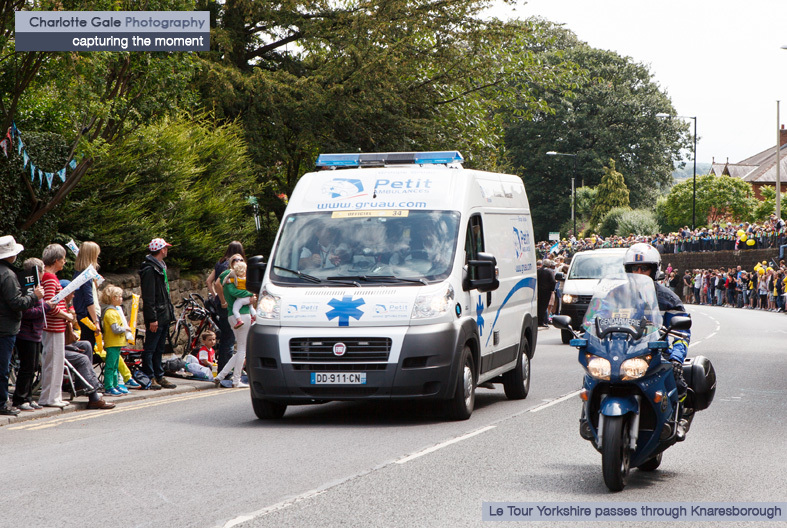 Yorkshire promised a Grand Départ to remember and we certainly delivered. 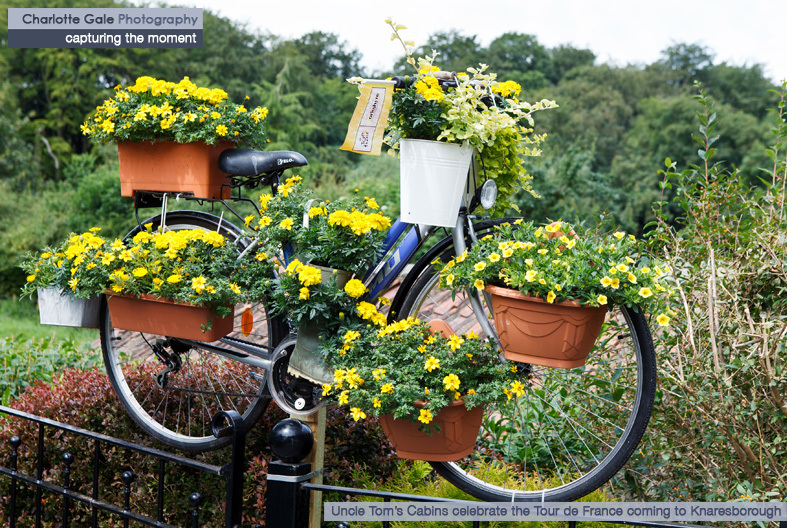 As the Tour grew closer, locals thought of innovative ways they could get into the spirit of the event without contravening strict brand guidelines. 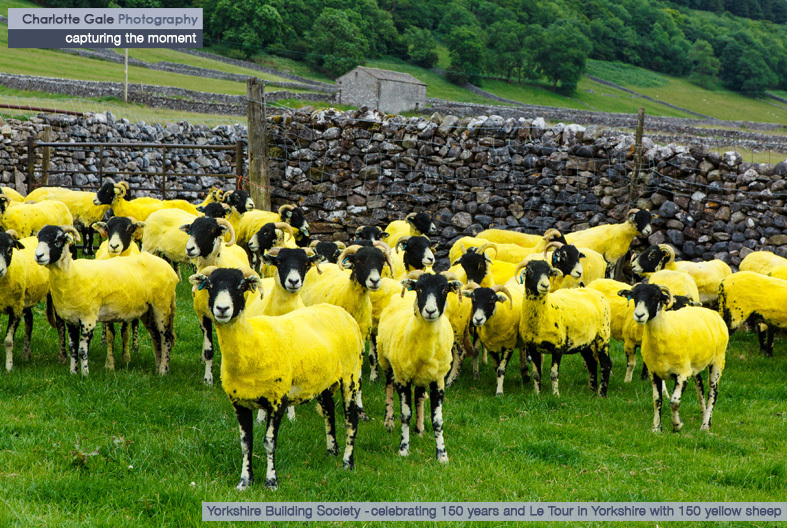 Colour featured heavily – from Yorkshire Building Society’s 150 yellow sheep grazing the hillsides of Kettlewell to the 100’s of yellow bikes and coloured jerseys that sprung up around the county. 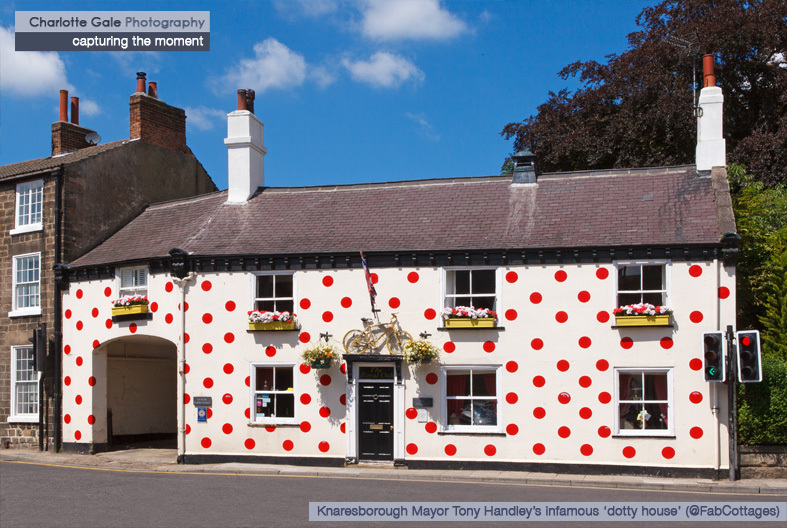 Knaresborough alone had over 2km of tour themed bunting strung around the town centre and our Local Mayor Tony Handley had even painted his house with red polka dots in honour of the occasion! 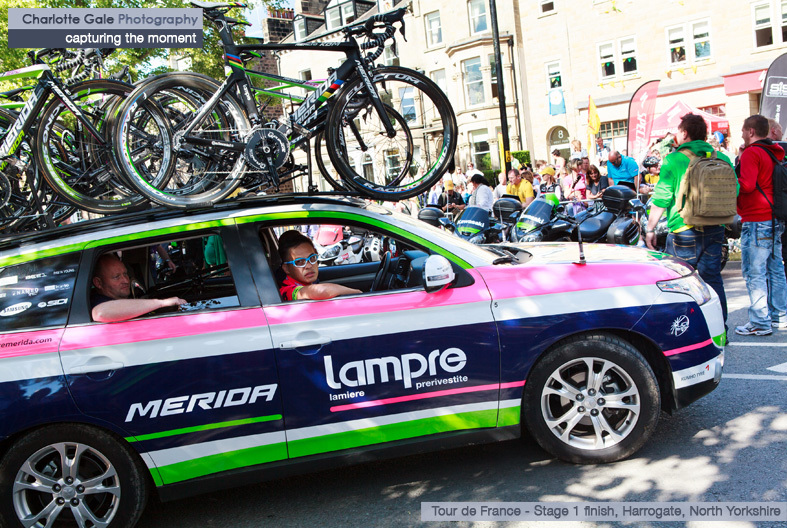 Suddenly, after months of preparation, the weekend of the 5/6 July 2014 was upon us all. 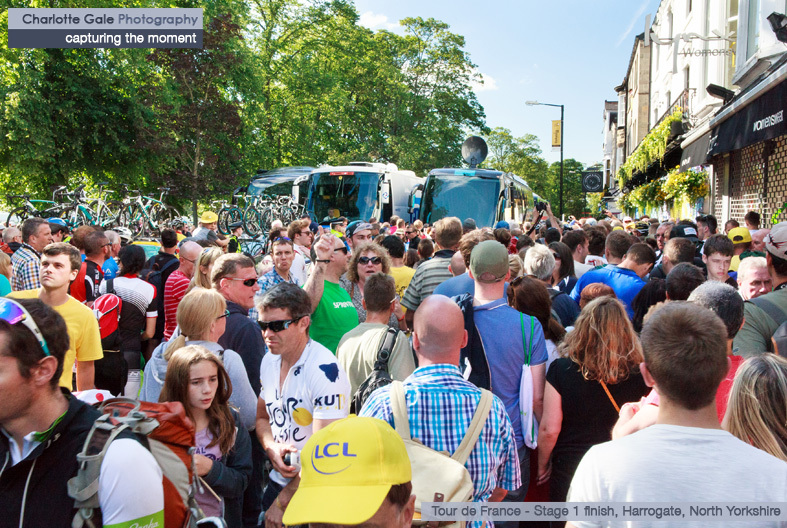 On Saturday morning I shoehorned my way onto the train at Knaresborough station, camera in hand, and set off with many other 1000’s of people to celebrate the World’s largest annual sporting event not just visiting Harrogate, but ending its first stage there. 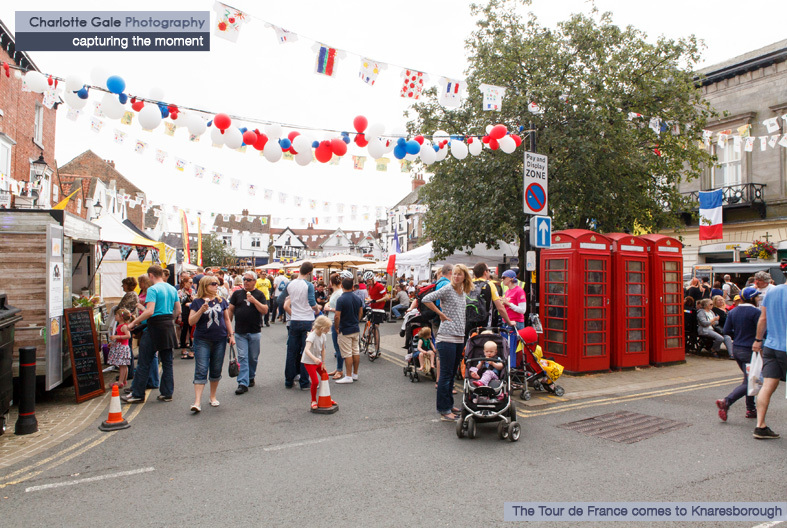 I was in good company – the Royals and Prime Minister David Cameron had turned out in force and there were even rumours that David Beckham was in town! 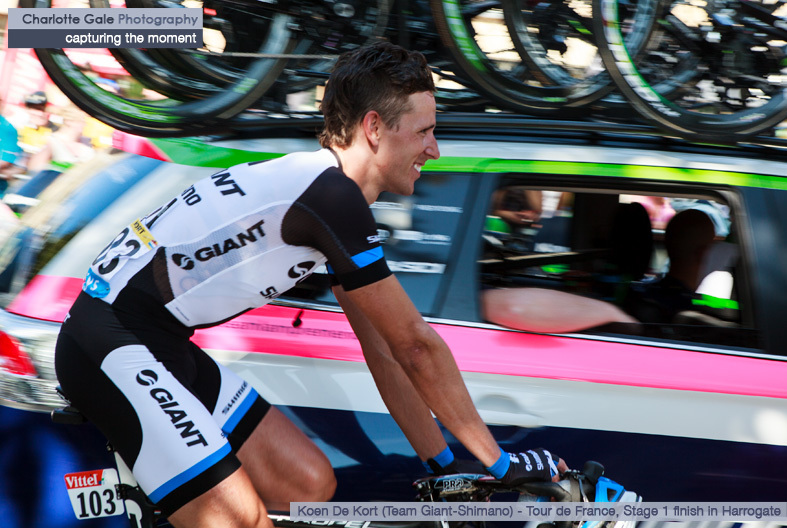 The day did not disappoint. 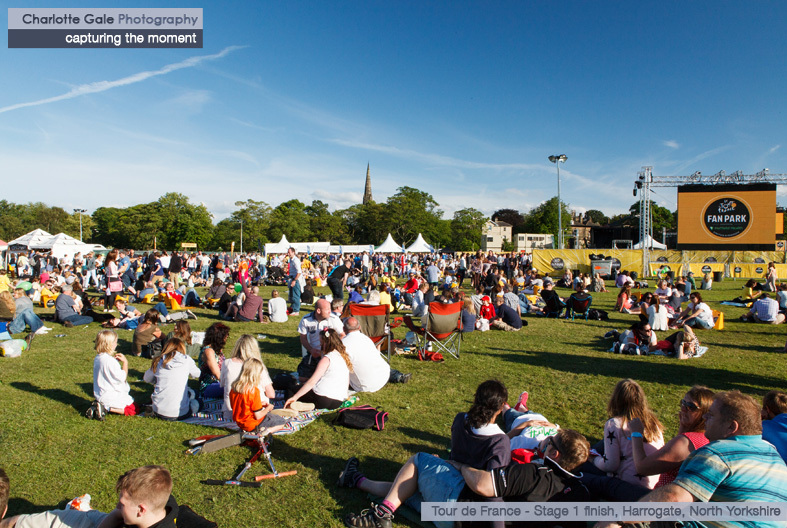 The forecasted rain never emerged and instead the sun shone against a brilliant blue sky. 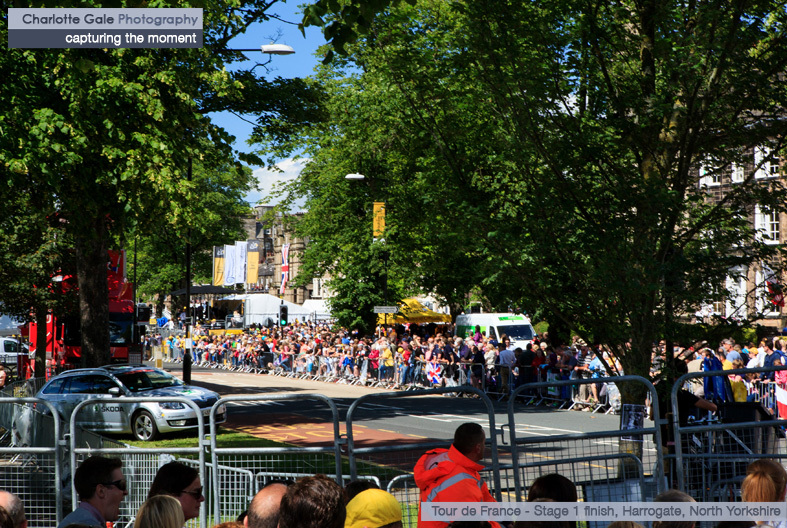 Many chose to line the streets, whilst others watched the race on a big screen in the purpose built fan park on The Stray. 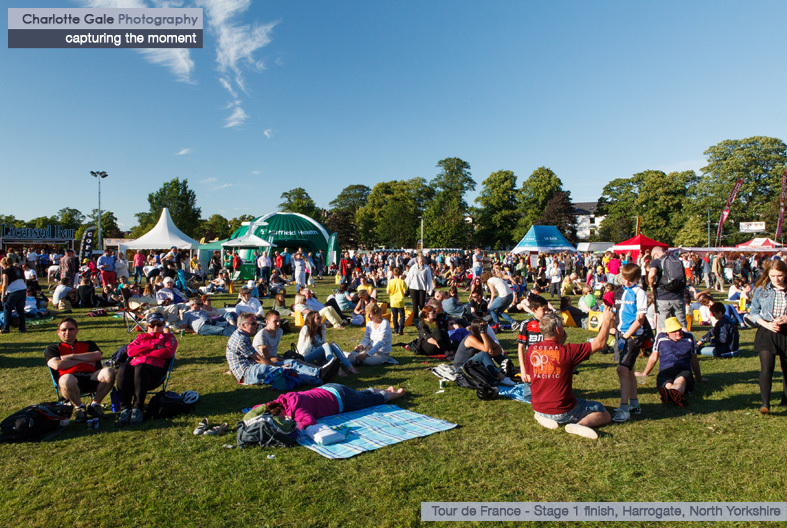 Later, as the riders and team entourage had left to prepare for day 2, 1000’s of friends and families enjoyed the evening sun on the Stray – eating, drinking and listening to the live music. 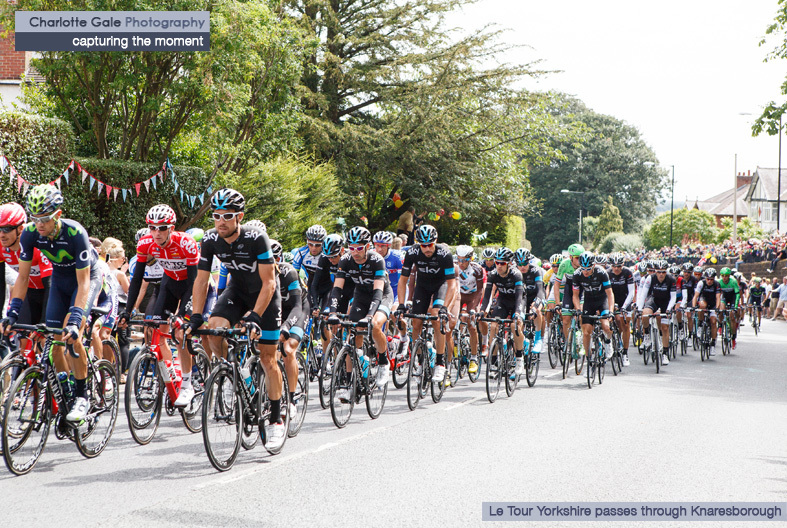 Sunday dawned and with it the opportunity to witness the Tour passing through my home town of Knaresborough. 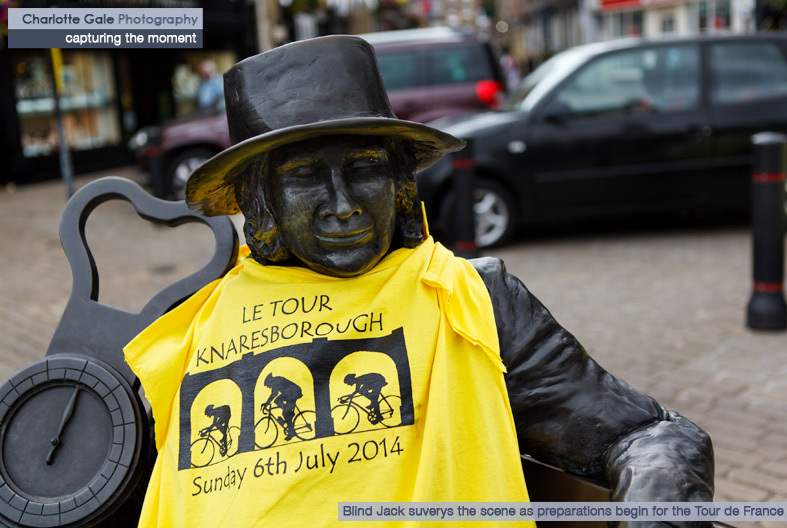 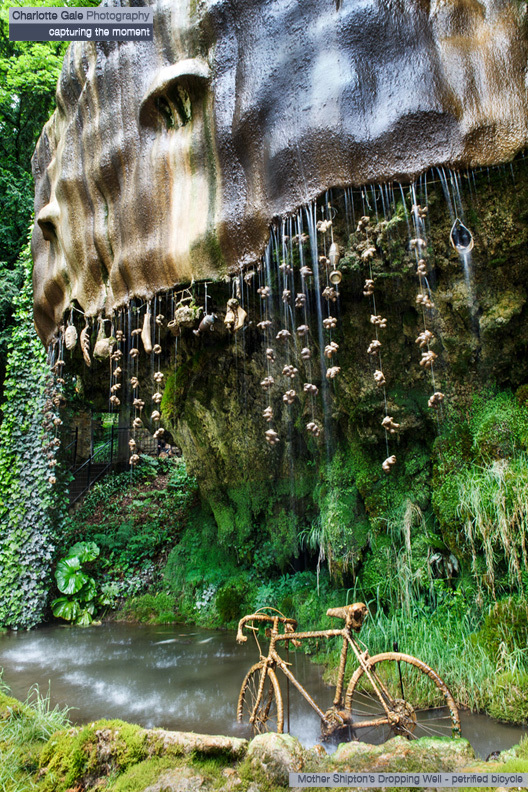 Voted the Tour’s ‘Best Dressed Town’, the townsfolk of Knaresborough had certainly got into the spirit of things and that included two famous former residents – Blind Jack and Mother Shipton. 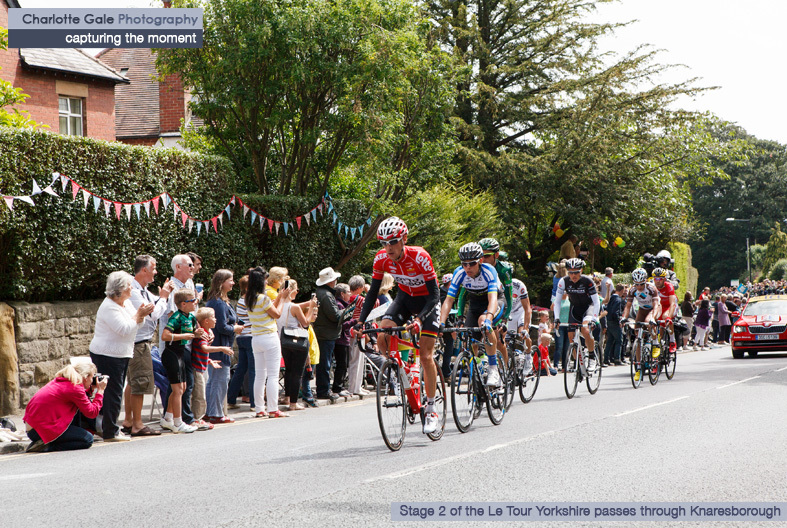 We located our preferred viewpoint early, choosing to watch the riders as they came up the small incline past King James school and into Knaresborough. 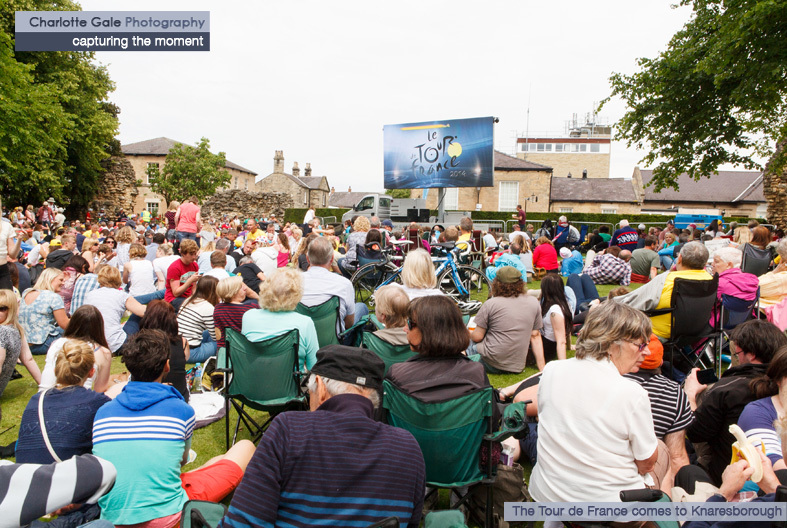 Of course Le Tour Yorkshire would not have been the success it was without the 100’s of volunteers who worked tirelessly behind the scenes. 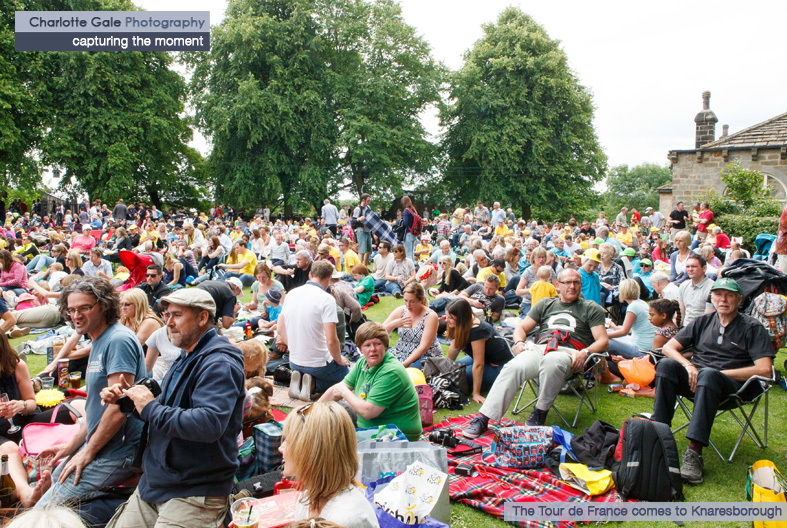 Inspired by the success of the London 2012 ‘Game Makers’, these ‘Tour Makers’ provided help and guidance to the many 1000’s of people who had chosen to visit our region to watch the Tour. 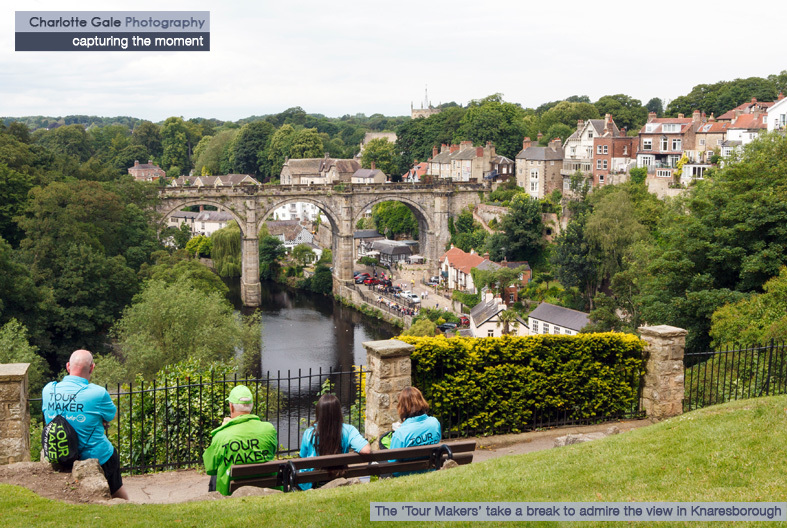 I therefore thought it fitting to end with a photo of four ‘Tour Makers’ taking a minute to enjoy the beautiful view from Knaresborough Castle towards the Viaduct and River Nidd below. 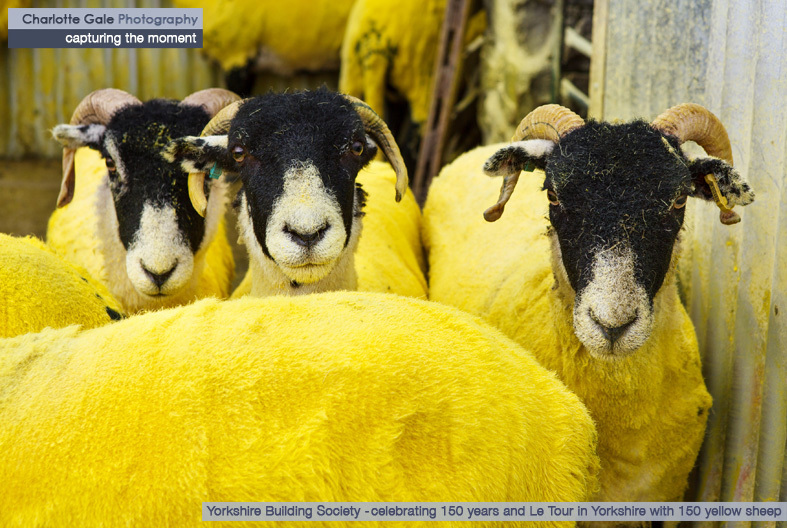 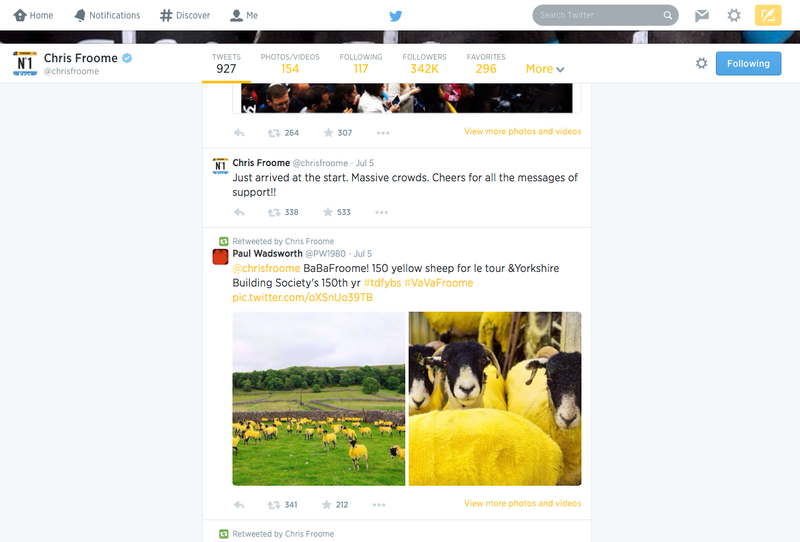 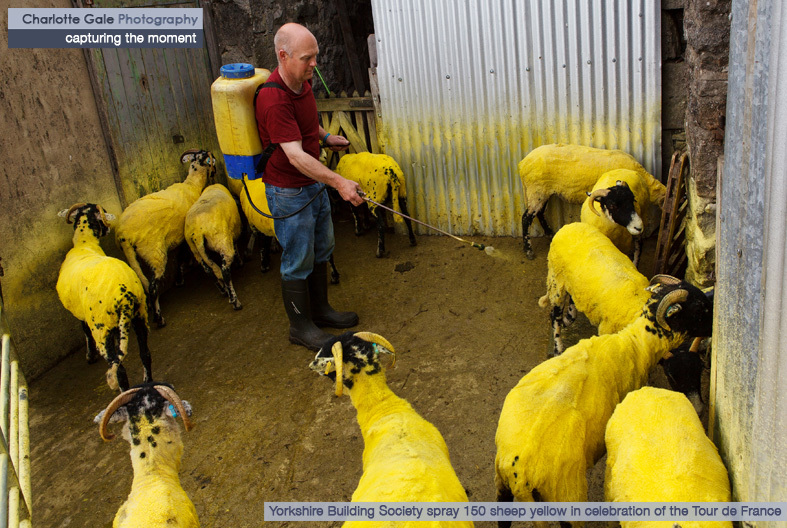 Speaking of Social Media and highlights, I couldn’t finish this post without including a screenshot of the retweet of my Yorkshire Building Society yellow sheep photos by none other than defending Tour de France champion Chris Froome of Team Sky! 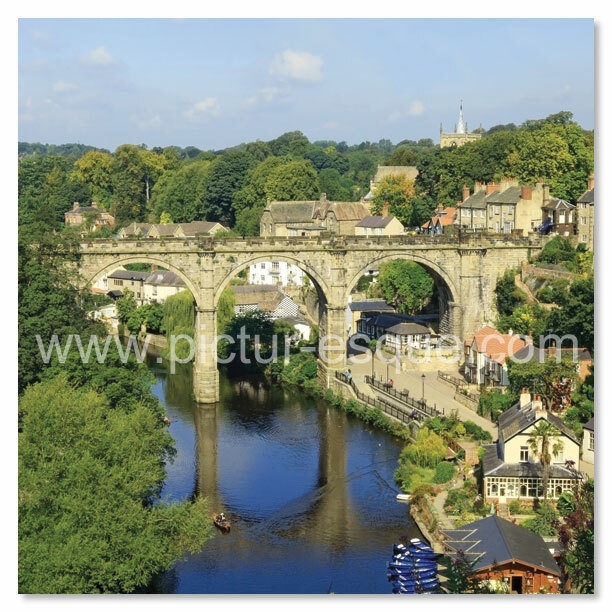 Greetings cards featuring views of Knaresborough Viaduct throughout the seasons are available to buy via my online shop: www.pictur-esque.com. 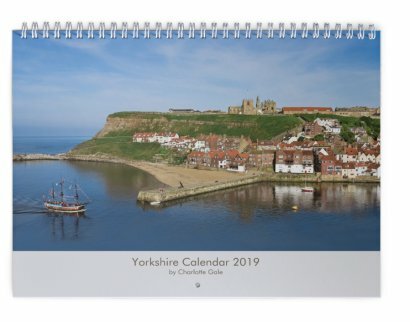 My 2019 Yorkshire Wall and Desk Calendars are now available to order online at pictur-esque.com. 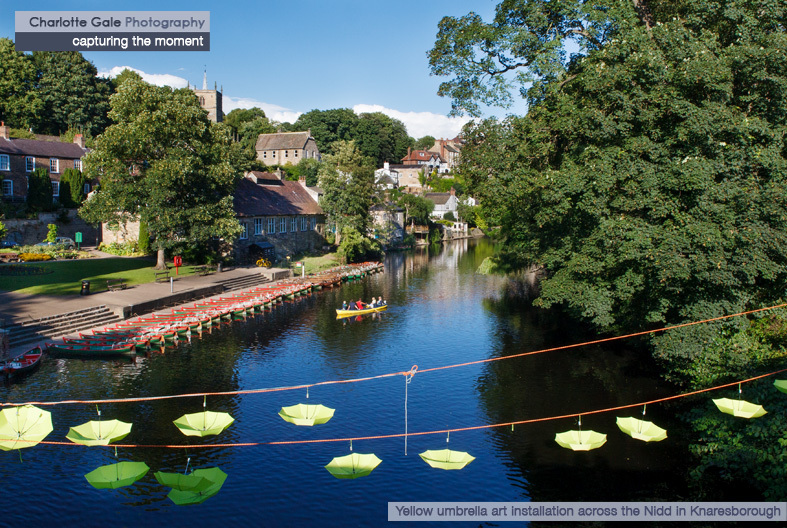 The calendars feature well known views from around the county, including Knaresborough Viaduct, Nidd Gorge, Whitby Harbour, Sutton Bank, Sandsend, the Yorkshire Dales, the North York Moors, Nidderdale, Goldsborough and The Stray in Harrogate. 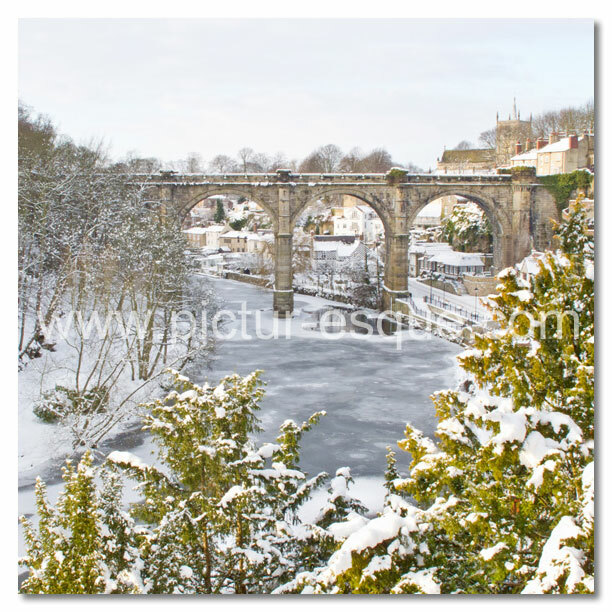 My Yorkshire calendars and Yorkshire & Knaresborough Christmas cards can be purchased online, by phoning 07745 538424 or emailing charlotte@pictur-esque.com. 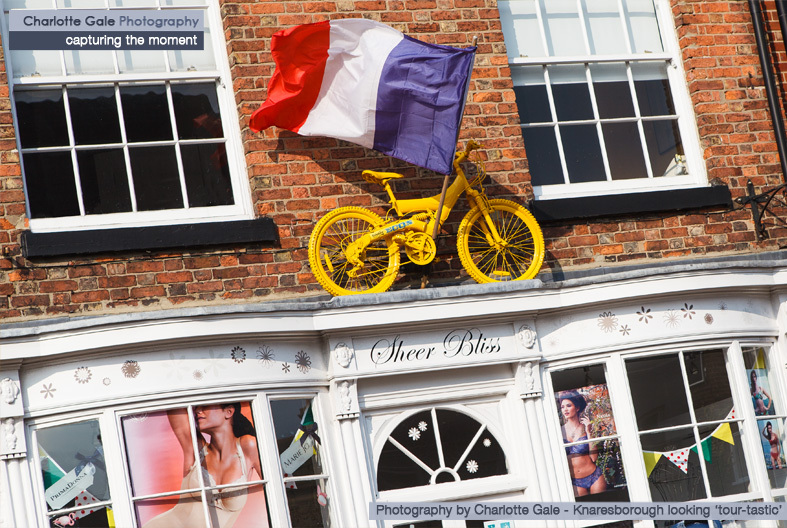 If you are local to the Knaresborough area, I offer free delivery to HG5 postcodes for all my greetings cards and photographic products. 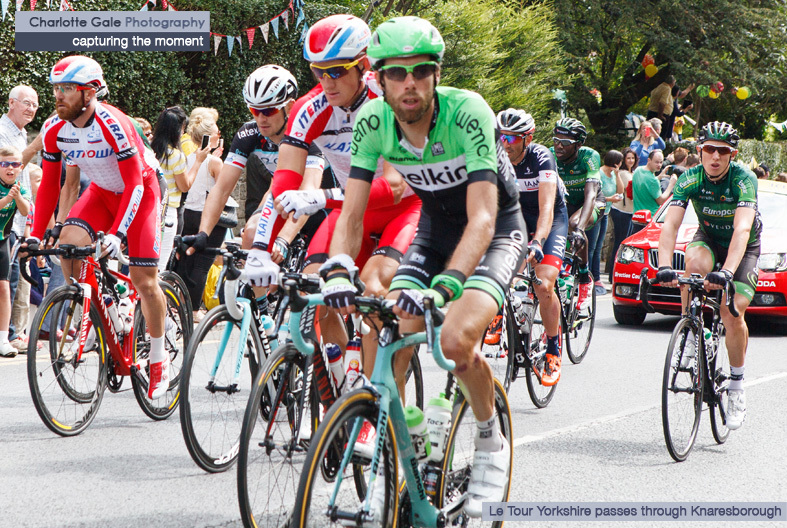 Simply select the relevant postage option when completing your order. 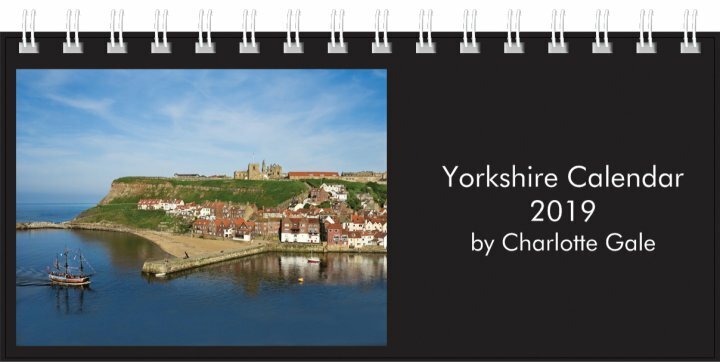 Alternatively, if you prefer to browse before you buy, you can purchase my cards from ZigZag Cards & Gifts on the High Street in Knaresborough and Oatlands Mount Post Office and Fodder in Harrogate, as well as a range of seasonal events.